The main disadvantage of latrines is often their bad smell and the breeding of flies. 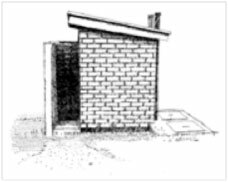 This improved version, from which its name is derived, was designed to find a solution to, or at least reduce, this problem : VIP (Ventilated Improved Pit) latrines. It essentially involves providing the inside of the latrine with a vertical ventilation pipe, referred to as a vent, the top of which is fitted with a fine-mesh insect screen. 2) Why should such latrines be used ? Besides their obvious advantage in terms of ease of use and comfort for others, these latrines help prevent the spread of diseases caused by flies, mosquitoes or other insects being attracted towards excrement and creating centres of infection. 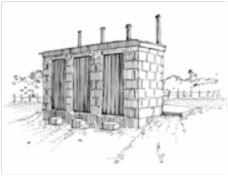 Virtually all users of latrines, but in particular those who have built them inside or near homes or those living in areas which are densely populated or where there is very little wind. 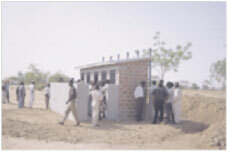 After choosing, as in the case of simple dry pit latrines (see Fact sheet E6), the right location for the latrine, and having dug a suitable pit, covered it with a slab and fitted it with an appropriate superstructure to provide privacy and protection against bad weather, a self-contained, no operating cost ventilation system has to be installed. a) How is this system installed ? First method : when making the slab, first provide it with a hole at least 15 to 20 cm in diameter to accommodate the vent pipe. If the slab is, for example, as is often the case, made of concrete, a part of the pipe can be used, when pouring the concrete, by placing it in the right place at the back of the latrine and removing it after a few hours. Then fit the vent pipe vertically. But another source of light then needs to be created to attract flies towards it. This is easily achieved by placing a small transparent window opening, made of plexiglass, for example, at this bend. Flies will first be attracted by this only visible light source, but, once reaching it, they will they see an even more intense light source vertically above them coming from the top of the vent pipe. Once fed through the slab or outside, the vent pipe will create a natural air flow between the pit and the top of the latrine’s superstructure. 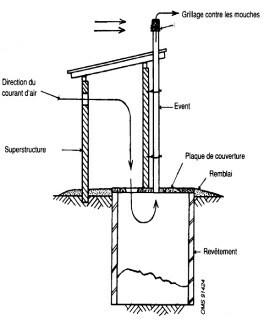 At the same time, it also provides a light source of for any mosquitoes or flies that may have managed to enter the pit (if the slab is not covered by a suitable lid or the lid is not closed properly) and which will be attracted to the top and be trapped by the wire mesh, which should not be forgotten, especially as it is very simple to fit, and eventually fall back into the pit and die..
b) How should the vent pipe be positioned ? The ventilation resulting from a naturally circulating air flow partly depends on the wind speed between the inside of the latrine and the pit and the exit of the vent pipe, and the temperature. If the wind speed slows down, however, it can continue to be enough provided the sun’s radiation is itself sufficient. It heats the wall and thus the air in the vent pipe and hence creates and updraft. It is therefore best to place the vent pipe on the sunny side of the superstructure. It is also often found that heat absorption is greater if the pipe is black rather than light. 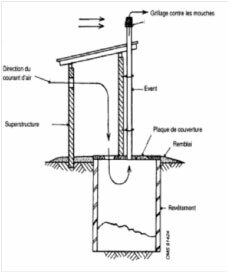 Their characteristics are the same as those of other pits (see Fact Sheet E5) except that the vent pipe should be sealed in the slab and in the roof if the first method is chosen. Note that the air flow can be improved, if necessary, by making the superstructure spiral shaped rather than rectangular to allow the wind to blow in more easily. Sketch and most of following sketches provided by WEDC, Loughborough University UK or OMS. 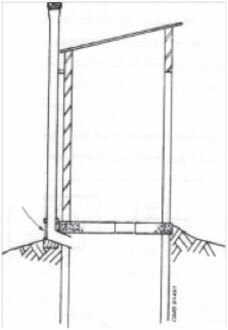 The pipe should be straight and positioned vertically (flies in the pit must easily see the light coming from the top). It should be 10 to 15 cm in diameter if made of PVC or other smooth material or at least 23 cm in diameter if made of rough material (slightly less if there are strong winds in the region). 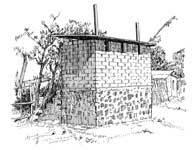 Finally, its end should rise above the latrine’s roof by at least 50 cm and preferably be widened to about 30 cm before being covered with a fairly fine screen, but with a mesh size large enough (about 1.5 mm for example) to prevent it becoming clogged with dust and allow air to flow freely. - An air inlet should be provided above the latrine door (with a cross-section equal to at least three times the cross-section of the vent) and the squat hole should not be closed (except in the evening if the air becomes too cool and reduces the vent draft too much) so as to promote air flow. - The door should be placed downwind relative to surrounding dwellings and facing the prevailing wind. - If the vent pipe is attached to the outside of one of the latrine’s walls, which is often recommended, it is best done on the sunny side (indeed, making the pipe warmer warms up the air flowing inside and increases the draft). - Finally, it is preferable for the inside of the latrine to be dark to avoid attracting flies. Its door should thus be closed. - They improve hygiene and health conditions and reduce odours, both for users and the neighbourhood. They are easy to maintain. - The installation of a vent pipe does not increase the latrine’s price significantly. - They are easily accessible by the elderly or disabled. - They are well suited as public latrines. - VIP latrines call for certain installation precautions and some know-how or the possibility of consulting an experienced person to ensure an effective air flow. - They only really work well if they are properly oriented with respect to the prevailing wind. - The inside of the stall must be fairly dark. - The most common latrines are single-pit VIP latrines. - Twin-pit VIP latrines are also fairly common when, for example, family communities are large or it is not easy or possible to dig deep pits (as in the case, for example, of shallow ground water or hard soil). In such cases, some models also have a superstructure which covers (with one or two doors) both pits, or a superstructure that can be moved from one pit to another when a pit is full. - or allow pit residues to be used, after leaving them to stand for at least two years to eliminate pathogens, to make compost which can be used for agriculture purposes after mixing. - Finally, some latrines are of the VIP ECOSAN latrine type (see fact sheet A10), with urine being diverted into separate compartments, in the case of the current most high-tech ecological latrines with making of compost and urine being used as a fertilizer with certain precautions, which although requiring cultural changes, eventually prove to be cheaper than just simple VIP latrines. The cost generally varies, according to the location or region, the pit volume, the quality of the superstructure and vent pipe and the use or otherwise of skilled labour, and whether the walls are made of masonry or not, from about €130 to €240 for a single-pit VIP latrine and €180 to €350 for a twin-pit VIP latrine. OCADES, the BURKINA FASO CARITAS, has, as part of a diversified programme for providing access to water, micro-irrigation, market gardening and sanitation worth €587,000 and co-funded by the Fondation Suez and the Fondation Ensemble, had twin-pit VIP latrines (30) built by craftsmen with the help of populations near new water holes, according to a model defined by the Burkina National Water and Sanitation Office (Dagnoin type). Designed for families of twenty people and with a filling time of two years for each pit, their total useful volume is 3 m3. 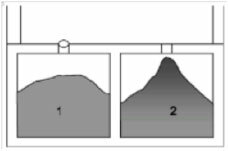 The depth of the pits, dug at least 10m from boreholes and 100m from wells, varies from 3 to 5m according to the region. Divided into two compartments 1.15m square built of solid chipboard covered with a cement render with a concrete bottom to prevent any risk of pollution of ground water by infiltration, they allow alternate, appreciated use of an odourless latrine and was preceded by a campaign to raise the population’s awareness to hygiene and environmental protection rules. The direct cost, excluding management and hygiene training expenses, amounted to €229 per latrine. - WASTE (Dutch site on sanitation) : www.ecosan.nl&nbsp ; where you can in particular find a very interesting illustrated booklet on the various types of low-cost sanitation solutions : "Smart sanitation solutions" or "Appropriate sanitation solutions"
- YouTube. Interesting video lasting 6’ entitled "Double vault latrine construction" in English but easily understandable showing all the stages in the construction of a twin-pit VIP latrine in Vietnam. 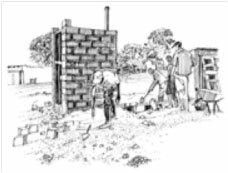 - YouTube : Video much shorter than 4’ entitled "How to construct a Ventilated Pit latrine" showing in pictures only how to construct a VIP latrine in Mozambique. 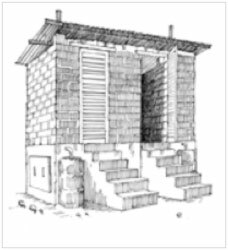 - WHO (World Health WHO in Geneva) : "A guide to the development of on-site sanitation" by R. Franceys, J. Pickford and R.Reed, which is, however, a farily general guide. - Action against Hunger : "Water - Sanitation - Hygiene for populations at risk"